Product #20721 | SKU ERIS E4.5 | 0.0 (no ratings yet) Thanks for your rating! 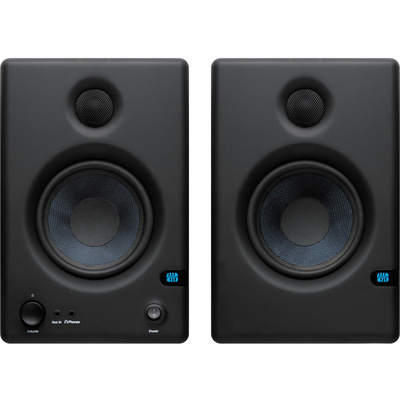 The PreSonus Eris E4.5 Hi-Definition 2-Way 4.5" Nearfield Monitors (Pair) are designed for recording studio tracking, mixing, and mastering. Each monitor features a 4.5" Kevlar woofer for midrange and a 1" silk dome tweeter for treble powered by a 25W class AB amplifier. For inputs, the monitors accept balanced 1/4" TRS, unbalanced 1/8" TS, RCA and bare-wire inputs. The back panel of the monitors feature adjustment controls for fine tuning the monitors to your listening room. The controls include ±6 dB gain for the midrange and ±6 dB for the high frequency output. A selectable high-pass filter with off, 80 Hz, and 100 Hz settings lets you listen with or without the bass, and an acoustic space setting with flat, -2 dB, and -4 dB settings lets you adjust the monitors for your room's acoustic characteristics. The cabinet uses resonance-suppressing internal bracing to optimise the sound output and the amplifiers include RF interference, output current limiting, over-temperature, transient, and subsonic protection circuits.